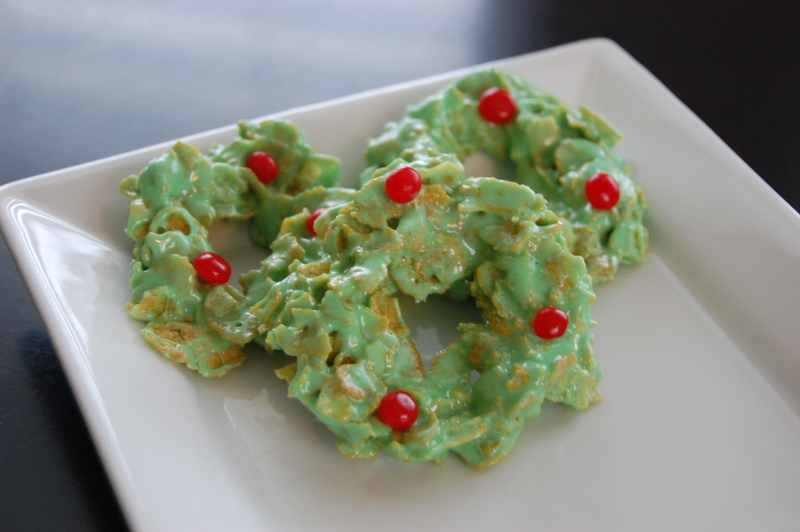 I have such wonderful memories of making these cornflake marshmallow wreaths with my Mom around the holidays. They are so easy to make and kid friendly. Best of all, they are so delicious! Measure out 6 cups of the cornflakes cereal into a large bowl. In a double boiler, melt the marshmallows and butter until smooth. Add the green food coloring and stir until well combined. Add the marshmallow mixture into the cornflakes and stir until all of the cornflakes are covered with marshmallow. Using buttered or damp fingers, scoop out about 1/4 cup of the mixture and shape into wreaths. Add cinnamon candies quickly before the marshmallow sets. Store in the refrigerator or an airtight container. Anne! I smiled when I saw your post – once again it seems that we must share a recipe book! These are some of my favorites.. not too sweet or rich, and they dress up a holiday platter too! These were a huge fail for me 😦 There didn’t seem to be enough of the marshmallow mixture so the corn flakes didn’t stick together well. I couldn’t shape them into anything and it mostly just looked like corn flakes with some green goo. Any idea what I did wrong? I mixed for a while to make sure I incorporated all the marshmallow, which I had. Boo, they look so good I was going to bring them to my in-laws for Christmas! Oh no! I am not sure why they wouldn’t have worked out. My only guess is that maybe you added an extra cup of cornflakes? I have made them so many times and have never run into that. Maybe next time just throw in an extra handful of marshmallows! So sorry they didn’t work out for you.